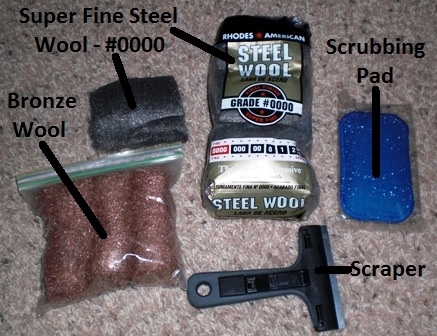 Steel Wool – This is super fine steel wool that is great for window cleaning, made sure to wet the surface prior to using and toss it at the end of the day as it does rust. Bronze Wool – The same as steel wool but it does not rust so you can use it more than one day. Scrubber Pad – This is your basic dish cleaning scrubber that works great for window washing too. Scraper – This is my last resort due to the slight risk of scratching the window. Scrapers are required when trying to remove things like paint, sap, and stain from windows so you can clean them. Make sure to wet the surface prior to using it and make sure you don’t back drag it across the glass. Show extra care on tempered glass since the glass has been changed in the factory and depending on the manufacturing method might now scratch easier due to the fact it is not very flat anymore due to roller waves from the tempering furnaces. Note – Use care on all windows until you know if there is any sort of coating on them for tinting or UV rays. All of these tools will scratch those coatings. Where to buy – Harry Falk has a great selection of all these window cleaning tools.